2010 arrived with a bang…and a little bit of rain. The streets the morning of the first of the New Year were empty, but even in the afternoon the city felt a bit lonely, without all the American students. You only left two weeks ago but we already miss you, and we wonder if you miss us (and Perugia) too. 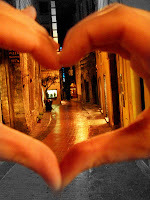 We hope the city will always be in your hearts and that you’ll come back to Via Bartolo sometime soon. A presto!